Most of my adult life has been spent experimenting with pigment behaviour. I originally worked with watercolour, a medium in which pigment characteristics are most apparent. But it was the fluid work of Paul Jenkins and more recently Holten Rower that inspired me to try something new and to explore fluid acrylics as a vehicle to create pigment effects. 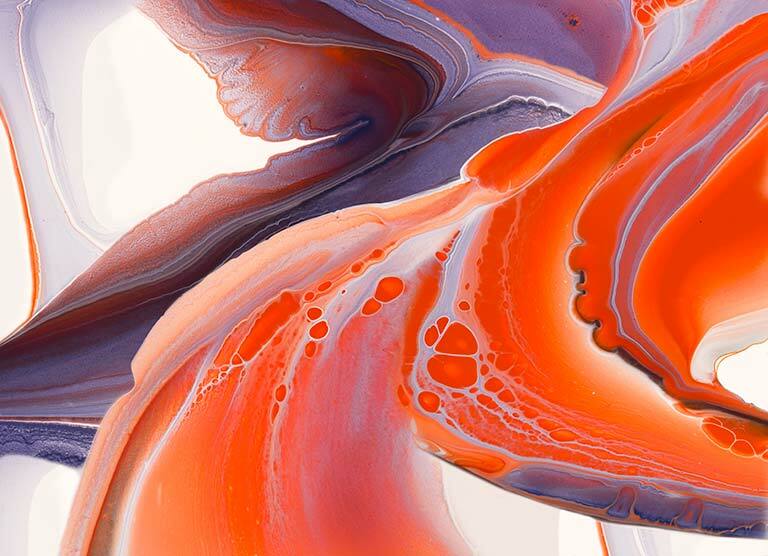 Having long known that pigments have different characteristics, I use the viscosity of fluid acrylics to harness their power to attract or repel each other as they vie for position in a flowing journey of evolving patterns. The explosive energy of hot pinks and reds and the slowly developing nature of blues and greens are brought alive in carefully mixed recipes of acrylics and ink. The resulting micro images seem directly related to patterns found throughout the natural world, rather microscopic or celestial. In forming the works for this collection, I select compositions from the micro images to produce large-scale fine art prints on high quality cotton rag paper using pigment inks. These are sold in in either single or up to 25 limited editions. I also have a selection of prints that I have further developed with paint and ink to create original artworks.